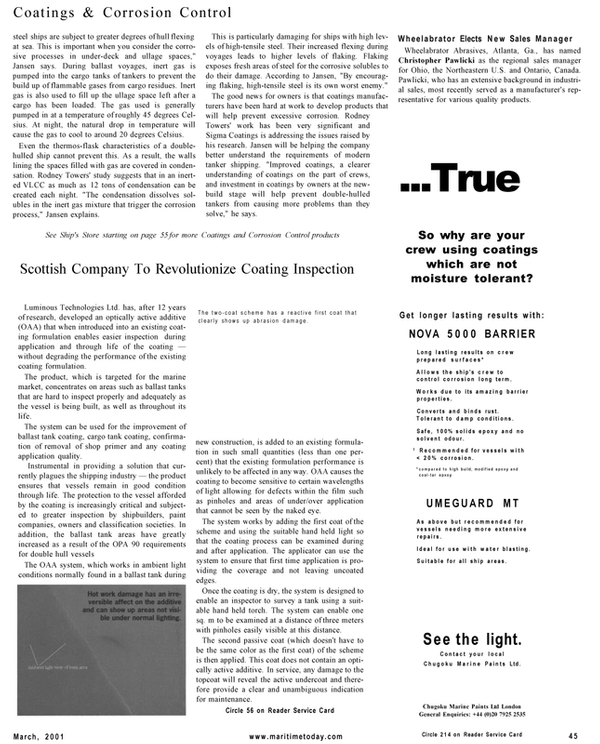 Luminous Technologies Ltd. has, after 12 years of research, developed an optically active additive (OAA) that when introduced into an existing coating formulation enables easier inspection during application and through life of the coating — without degrading the performance of the existing coating formulation. The system can be used for the improvement of ballast tank coating, cargo tank coating, confirmation of removal of shop primer and any coating application quality. Instrumental in providing a solution that currently plagues the shipping industry — the product ensures that vessels remain in good condition through life. The protection to the vessel afforded by the coating is increasingly critical and subjected to greater inspection by shipbuilders, paint companies, owners and classification societies. In addition, the ballast tank areas have greatly increased as a result of the OPA 90 requirements for double hull vessels The OAA system, which works in ambient light conditions normally found in a ballast tank during new construction, is added to an existing formulation in such small quantities (less than one percent) that the existing formulation performance is unlikely to be affected in any way. OAA causes the coating to become sensitive to certain wavelengths of light allowing for defects within the film such as pinholes and areas of under/over application that cannot be seen by the naked eye. The system works by adding the first coat of the scheme and using the suitable hand held light so that the coating process can be examined during and after application. The applicator can use the system to ensure that first time application is providing the coverage and not leaving uncoated edges. Once the coating is dry, the system is designed to enable an inspector to survey a tank using a suitable hand held torch. The system can enable one sq. m to be examined at a distance of three meters with pinholes easily visible at this distance. The second passive coat (which doesn't have to be the same color as the first coat) of the scheme is then applied. This coat does not contain an optically active additive. In service, any damage to the topcoat will reveal the active undercoat and therefore provide a clear and unambiguous indication for maintenance.